GOLD! was the cry shouted at Sutter's Mill in 1849 and hundreds of sailing ships were pressed into service to transport the 49'ers from the east coast to California. Many, far too many, of those ships came to grief on the rocks of the dark and fog shrouded coast. The U.S. Lighthouse Service successfully petitioned Congress to construct lighthouses along the west coast. 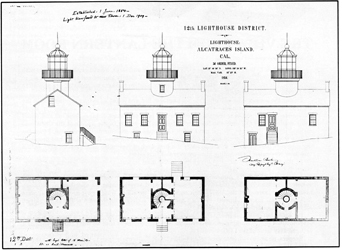 When the contract was awarded it called for seven lighthouses to be built including Alcatraz.